This week is an interesting Fantasy Baseball waiver wire piece and one that could prove to be highly important with all the injuries popping up across the league. I mean seriously, injuries up the ying yang lately, including a groin strain for Mike Trout that caused his fantasy owners to have a mini panic attack earlier this week. The waiver wire is always an important resource, especially in those times when you had a player or two hit the IL (still looks weird) as many fantasy owners have endured over the last week or so. Well, hopefully, this week’s Fantasy Baseball Waiver Wire article can help ease the pain of losing some of your key players or at least put a band-aid on your wound to stop the bleeding. 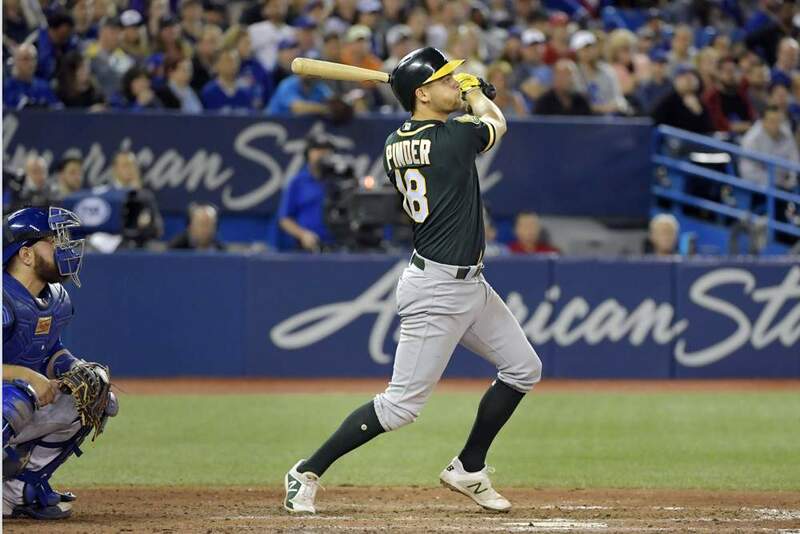 A trendy late-Spring sleeper pick, Chad Pinder fell back off the radar a little bit after starting just four of Oakland’s first eight games (Japan games excluded) and going just 3/16 in those games. But with his playing time trending up, Pinder is firmly back on the mixed league radar. Pinder has started four of Oakland’s last five games and has recorded at least one hit in six straight starts with three multi-hit games in his last four. This little hot streak has raised his average to .333 with three home runs, eight RBI, and nine runs scored in 48 AB. I can see why some would still be a little skeptical as Pinder doesn’t have a permanent defensive home or guarantee to be in the lineup every day. Luckily, he’s able to play all over the diamond and has received a little boost in playing time since the Matt Olson injury. As of now, Pinder has received time at 1st, 2nd, 3rd, left, and right field and that’s a trend that should continue moving forward. Basically, think of him as Brock Holt with more power potential and higher upside overall. If he continues to play regularly moving forward, Pinder could be a sneaky power play with middle infield eligibility and a respectable batting average. Mix those two together and you have a combined projection of .300/23/75/98. Nathan even took it one step further and boldly predicted that Winker would lead the Majors in runs scored. I say boldly as it was in his bold predictions piece, but in my mind, I agreed with him. Winker possesses plus contact skills with a plate approach that just screams .400+ OBP. And with him penciled in at leadoff for a sneaky-good Reds lineup, scoring well over 100 runs didn’t seem so far-fetched. All of that upside hasn’t gone anywhere folks. Sure, a 5/34 start stinks and isn’t what we expected. But so what? Four of those hits have come in his last three games along with both of his home runs this season. It looks like Winker is beginning to break out of his slump and needs to be owned in all leagues. I was on the fence about including Galvis here and then he went 4/4 with a dinger last night against my Red Sox. Okay, okay Freddy, I’ll include you. Last night marked the 6th straight game with a hit for Galvis and his 3rd multi-hit effort in his last four games. Although he’s displayed double-digit pop in the past, Galvis’ four homers so far is a bit of a surprise. That is, until you see his career high 51.6% fly ball rate and 18.8% HR/FB ratio. While it’s highly unlikely that this power pace continues, it’s not like Galvis hasn’t proven to be a consistent power/speed threat in the past. In his four full seasons of action from 2015-2018, Galvis averaged 13 homers and 12 steals per season while hitting anywhere from .241 to .263. And with him now hitting 1st or 2nd in the order, there’s some upside in the runs scored department here too, especially after Vladimir Guerrero Jr debuts. Galvis needs to be owned in more leagues while he’s this hot and there’s some ROS appeal here too. Taking the human out machine Chris Davis out of this, not many full-time Major Leaguers had a rougher start to the season than Willy Adames. After a 1/27 start with 14 strikeouts in his first seven games, Adames has come alive over the last five games, recording nine hits in 19 at-bats with seven runs scored. He’s still yet to draw a walk, hit a home run, or steal a base this season, but with Adames bat finally coming alive, he’s worth a shot in deeper mixed leagues to see if this little hot streak is the start of something more. Doesn’t it feel like Moreland is a name you see in waiver wire pieces several times each season? Well, 2019 doesn’t appear to be any different. Technically, Mitchy Four-Bags is in a “Platoon” of sorts at first base with Steve Pearce, but with Moreland being the lefty batter part of the platoon, he’s going to receive the bulk of the playing time at first, which has been the case this season, even after Pearce’s return. Pop quiz time. Who leads the 2019 Boston Red Sox in home runs? Mookie? Nope. JD Martinez? Also no. That’s right, Moreland and his five ding dongs currently lead all Boston hitters. On top of that, Moreland has added 12 RBI, six runs, and five walks with a .275 average. He has a knack for getting on multiple long hot streaks each season and it looks like we’re in the middle of one right now. This power uptick could be for real too, as Moreland is sporting career-high marks in flyball rate and hard contact (both 46.4%). Oh no, Eric is recommending a player hitting .140 with a .436 OPS, he’s lost his marbles. While that’s hopefully not the case just yet, I am recommending Kevin Pillar as a waiver wire add this week if you need some outfield help that can give you some power and speed. This is kind of the same situation we have with Winker above as Pillar only has six hits on the season thus far, but four of those have come in the last four games including three home runs. From 2015-2018, Pillar averaged 12.5 HR and 17 steals while hitting anywhere from .252 to .278. Moving from Toronto to San Francisco isn’t the greatest move for a player’s power, but Pillar should once again be a double-digit power/speed threat with a batting average that won’t haunt you too badly. If you need some outfield help in 12-team leagues or deeper, I’d give him a look. Man, there are so many good young arms in Atlanta. When discussing these young arms, most people mention the likes of Touki Toussaint, Mike Soroka, and Kyle Wright first, and for good reason. But the man pitching better than all three of them right now is Max Fried, a former top-100 caliber prospect not too long ago. 254 pitchers have logged at least 50 innings as starters since 2017. Here's the league- and park-adjusted ERA leaderboard from that group. After making two relief appearances, Fried moved into the rotation and has looked really good in his two starts. He fired six shutout innings against the Cubs on April 4th and followed that up with another six innings against Colorado on April 9th, allowing just one unearned run. Combined, Fried’s two starts produced 12 IP while only allowing six hits, zero earned runs, one walk, and nine strikeouts. With a fastball sitting around 93-94 and one of the best curveballs in the game, Fried has some solid long-term appeal and is making a strong case to remain in the rotation moving forward. While he’s pitching this well, he needs to be owned in all mixed leagues. While most of the attention has been on Chris Paddack, another rookie in San Diego has been pitching equally as well to start the season. Through his first three starts of the season, Nick Margevicius has a 1.69 ERA, 0.63 WHIP (Leads League), and a 12/1 K/BB mark. Not too shabby. While his addition to the Padres rotation was a little surprising given that he has never pitched above the High-A California League, Margevicius is more than holding his own so far. He pitched well in the minors with a 3.00 ERA, 1.16 WHIP, 1.2 BB/9, and 10.2 K/9 in 32 combined and possesses appealing upside moving forward. While he’s not going to be a guy that blows away hitters (fastball usually sits in the high-80s), Margevicius has plus command/control, a good feel for pitching, and a dynamic curveball in the low-70’s. He’s well worth a look for pitching-needy fantasy owners and will draw a home start against Colorado early next week. Even with how bad the Red Sox have been this season, firing eight innings of one-run ball with nine strikeouts against the likes of Betts, Benintendi, and Martinez is impressive. That start gave Kelly two straight quality starts to begin the season with a 12/2 K/BB ratio across 14 innings. After pitching well during his KBO stint, Kelly was a popular sleeper during Spring Training with Pitcher List even asking the question, “Is Merrill Kelly 2019’s Miles Mikolas?” While I’m not sure I would personally go that far, there is definitely some mixed-league appeal here moving forward. Kelly starts tomorrow against the Padres and projects to go again in Wrigley against the Cubs later next week. A former top-100 prospect, Tyler Mahle struggled with his control over his first season-plus with Cincinnati and saw his ERA balloon to 4.98 last season in 23 starts. While he’s never been a Shane Bieber type of control artist, Mahle displayed above-average command in the minors, routinely sitting in the 2.0 BB/9 vicinity at each level. It’s only two starts, but Mahle has lowered his walk rate from 4.3 last season to 3.3 this season. If he can keep his control in check, which I believe he can, Mahle has top-50 SP upside over the rest of the season. And for all of you that love scooping up two-start pitchers each week, it’s looking like Mahle will get two starts on the road next week against the Dodgers on Tuesday and the Padres on Sunday. Well, there are no slam dunk new closing options this week, but the Royals calling up Richard Lovelady has some sneaky fantasy appeal for those in holds leagues. Lovelady is a three-pitch lefty reliever with a low to mid-90s fastball, plus slider, and a developing changeup. In 46 appearances (73 innings) last season for Triple-A Omaha, Lovelady recorded a 2.47 ERA, 1.01 WHIP, and nearly a strikeout per inning. This Kansas City bullpen has looked awful to start the season, ranking 28th in bullpen ERA, so expect Lovelady to get some looks in holds situations right away and potentially sneak some save opportunities in as the season progresses. Photo/Video Credit: Jeff Chevrier/Icon Sportswire, Jarred Carrabis/Boston Redsox, Zach Dillard, Cincinnati Reds.